Epiphone proudly announces the new Ltd. Ed. 2014 Tak Matsumoto DC Custom Outfit, the first Tak Matsumoto-designed signature model by Epiphone to be made available outside of Japan. Designed by Tak Matsumoto exclusively with Epiphone, the Ltd. Ed. 2014 Tak Matsumoto DC (“double cutaway”) Custom Outfit is the signature “Tak” that fans around the world have been waiting for. The Tak Matsumoto DC Custom brings together the artistry of Tak Matsumoto and his long association with Epiphone in spectacular fashion. 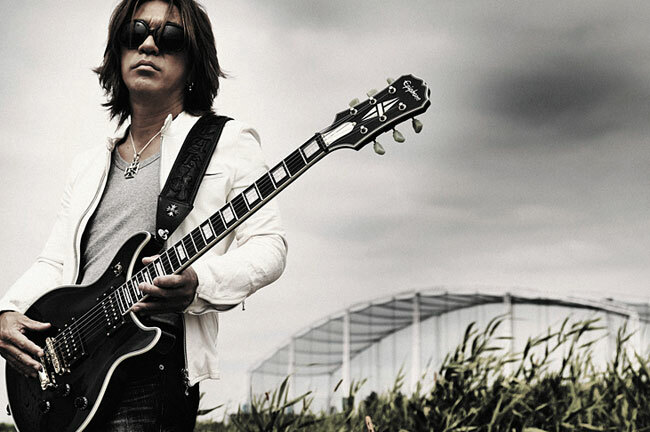 Tak Matsumoto is known throughout the world for his blistering solos, his groundbreaking work with the pop band B'z, and his stunning GRAMMY winning album with jazz great and close friend Larry Carlton. But Matsumoto is also revered for his beautiful Epiphone signature models that up until today have only been available in Japan. Now with the new Ltd. Ed. 2014 Tak Matsumoto DC Custom Outfit, one of Japan's true masters of the fingerboard and one of the world's most powerful rockers brings the soaring sound of his “DC” design to guitar players worldwide. The Epiphone 2014 Ltd. Ed. Tak Matsumoto DC Custom comes with Epiphone’s Limited Lifetime Warranty and unbeatable Gibson's 24/7/365 Customer Service for a lifetime of worry-free rocking. The Epiphone 2014 Ltd. Ed. Tak Matsumoto DC Custom is finally making its worldwide debut. And now its time for yours! Play one today at your Authorized Epiphone Dealer. Truss Rod Cover Gold Metal with engraved "Tak Matsumoto"
The Ltd. Ed. 2014 Tak Matsumoto DC Custom Outfit embodies Tak's own asymmetrical take on the popular DC Standard style and features a carved Mahogany body and a beautiful deep Ebony gloss finish. The Tak Matsumoto DC Custom’s solid Mahogany body conjures a broad, rich, ringing tone with outstanding harmonic color and an extremely well balanced frequency range. The Mahogany SlimTaper™ 1960s "D" profile neck has a 24.75" scale and is attached to the body with a deep-set glued-in neck tenon, which further enhances resonance and sustain. The 22 fret Ebony fingerboard has a 14" radius for fast and easy fretwork and includes a 1.68" nut and abalone block inlays. 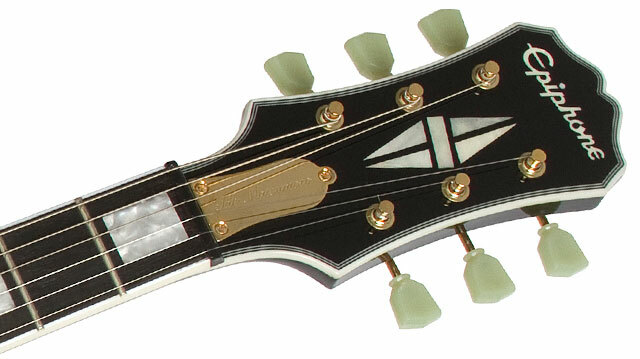 The headstock features the classic “LP Custom”-style inlay pattern with the Epiphone logo in pearloid and a “2014 Limited Edition" logo in gold print on the back of the headstock. The trussrod cover has the classic “bell-shaped” Kalamazoo factory design in gold with “Tak Matsumoto” in script. 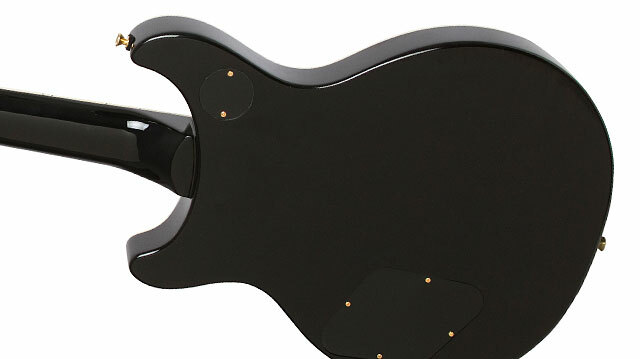 The DC Custom’s Mahogany top has 7-layer (white/black) binding and the neck has single layer white binding with 5-layer white/black binding on the headstock. For the 2014 Tak Matsumoto DC Custom, Tak Matsumoto choose open coil Gibson USA BurstBuckers™ with gold screws that blend perfectly with the gold hardware and Ebony gloss finish. The neck position features a Gibson BurstBucker™-2 that’s wound in the range of original PAFs for a warm, thick vocal tone. 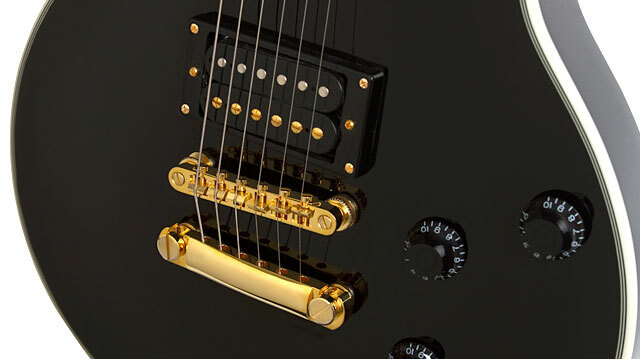 For the bridge position, Tak choose a Gibson USA BurstBucker™-3, which emulates the “hotter” PAFs that were “over-wound” by hand, giving you more wail and crunch from the bridge position. Unlike original PAFs that are nearing the end of their life, these BurstBuckers™ are vacuum potted to combat microphonic squeal at high volume. So play your DC Custom turned up high! Tak Matsumoto DC Custom’s pickups are routed through Tak's specially designed wiring scheme featuring a volume control for each pickup and one master control. Each control is a Black “Top Hat” knob with a black toggle cap. The toggle has a black cap and black toggle washer with “Rhythm/Treble” in gold. The Ltd. Ed. Tak Matsumoto DC Custom features Epiphone's tried and true gold LockTone™ Tune-o-matic bridge and StopBar tailpiece, which combines precise adjustment for intonation and action with rock-solid resonance. The LockTone™ Tune-o-matic design holds tight to the posts for hassle-free string changes and unparalleled sustain. The classic Deluxe machine heads have Tombstone style buttons and a 14:1 ratio. 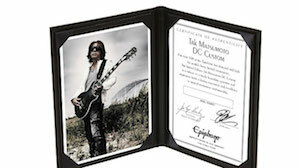 And like all of Tak Matsumoto’s signature Epiphones, his new DC Custom also includes Epiphone Strap-locks. And best of all, each new 2014 Ltd. Ed. Tak Matsumoto DC Custom comes with a custom hard case featuring the Tak Matsumoto signature in gold print and a Certificate of Authenticity in a binder.